Arthur Frommer's Budget Travel Magazine lists Villa Del Mar as one of 5 'standout rentals' in their 'Dream Trips' (March '10 issue, pg. 30). 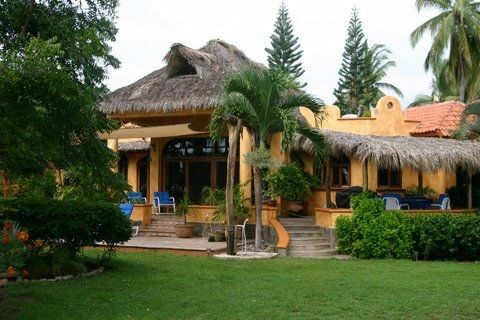 BEACHFRONT VILLA DEL MAR IS THE ONLY FOUR BEDROOM VILLA IN PLAYA LAS TORTUGAS! It sits in a serene stand of coconut palms and tropical gardens on a spectacular 5 mile pristine undeveloped beach. Our soft sand flat beach is perfect for swimming and long leisurely strolls and is designated as a protected Sea Turtle nesting habitat. Witnessing mama sea turtles as they come up to our beach to lay eggs or joining volunteers at our neighboring turtle rescue center to release baby turtles back to the sea are truly moving experiences. One of the best surfing spots on the coast, bring your own board or enjoy the waves on the Villa's boogieboards. Canoes and sea kayaks are available for exploring the spectacular adjacent estuary, home to hundreds of bird species and other wildlife. The villa's interior features hand-crafted Mexican furnishings and Central American artifacts, showcased under a soaring 20 foot traditional palapa ceiling, creating an ambiance that reflects our serene setting. Each of the four private bedrooms opens to its own beach facing patio. Traditional Talavera tile accents a gourmet kitchen that is fully equipped for the casual or more serious chef. For those seeking total relaxation, meals can be provided by our cook, highlighting the delightful local cuisine. Or freshly caught and grilled seafood can be enjoyed at nearby seaside open-air restaurants. For those who want to stay connected, we offer wireless internet and an indoor/outdoor Ipod friendly sound system. Our on-site property manager can assist with any needs you may have during your visit, such as arranging transportation, food provisioning, meal service, fishing and other excursions, horseback-riding and other activities. Our private Tahitian-inspired 200 sq.ft. beachside palapa is the perfect spot to practice yoga, hammock lounge, whale watch, or gather for sunset drinks to toast the end of a perfect day in paradise! This spacious single-level, beachfront home is the ideal gathering spot for family, friends, or small groups, and provides the perfect environment to relax and rejuvenate in this magical beach paradise! Email or call for more pictures and information! All bedrooms open to beach-facing patios with separate entrances!